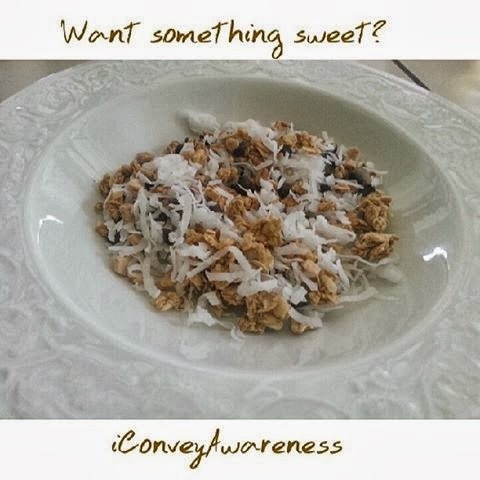 Conveying Awareness with Jessica David: #ctransc Week 4 - Half way through! I'm leading a Clean Transformation Challenge (#ctransc) that began on 9/1/13. Each session runs for 6 weeks. I'll be chronicling my experience while on the #ctransc. As a certified L.E.A.N. health coach, I believe that whole foods are a better source of nourishment than synthetic isolated multivitamins. I also prefer plant based protein over whey / casein. 1) Maintain my healthy weight. 5) Lose 2 inches around my waist. I will enjoy running by the end of 6 weeks! 6) Continue drinking half my body's weight in ounces of water daily. Day 1: It is Sunday. I made pancakes from Bob's Red Mill organic pancake & waffle mix. Served it with pure maple syrup and sliced bananas. I scrambled some eggs and served it with turkey bacon (until I can get my hands on nitrite/nitrate free turkey bacon, I limit my consumption). I snacked on fruit throughout the day and then had a turkey burger without the bread and topped with tomatoes, lettuce, and cucumbers. Mid-day snack which consisted of managing my sweet tooth fix was a bowl of Bob's Red Mill granola, Enjoy Life chocolate chips, and sweetened shredded coconut. I drank a chocolate, coconut, and peanut butter shake for dinner. I failed to mention that at some point during this day I pulled my lower back. Urgh! My husband has an inversion table and though I hate the feeling of hanging upside down, I felt some relief. I've been alternating arnica and peppermint oil as well as lots of stretching. Day 2: Still in some pain in my lower back so I'm skipping the gym today. Started off with a coconut and chocolate Complete shake. I have some paperwork to catch up on today so it's an official 'office' day. Day 3: Started my morning off with a chocolate Complete shake. I don't drink coffee. I don't even like the scent of coffee! So I'm a water drinker and now with this #ctransc in place, I'm drinking way more plant based drinks and I've been satisfied. I went to the gym this morning but only could spend a half hour there so I walked on the treadmill. I met with a client this morning. I contacted some prospects regarding my L.E.A.N. consulting services. Day 4: Spent an hour at the gym again. The way I spend my time there: stretching, treadmill 13-16 minutes, stretch again followed by leg presses, then arm exercises (including free weights). I stretch in between and then go to calf raises then so on and so on. I don't do all of one body part at each work out... yet. I may switch and do leg day, arm day, ab day, etc., but currently I'm working each part of my body with each hour I'm in the gym. My body is getting stronger and the recovery has been positive. Other than a sore back once and a dull pain in my right knee, I'm doing great things! You can too. 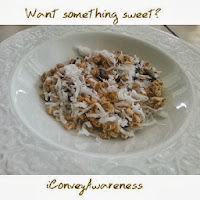 I enjoyed a chocolate Complete with coconut milk and shredded coconut. It was a sweet surprise. Pretty yummy and I drank it before I met my client and in between bringing my son home from swim practice. Day 5: One hour in the gym again. Today and yesterday I haven't been focusing on decreasing my time on the treadmill to earn my one mile. I'm keeping a good pace though I did walk at a 4.2 today which was exhausting. I stuck with it for the last half of my mile. Lots of stretching. My leg presses are up to 160 pounds and my calf raises are up to 40 pounds. I had another coconut and chocolate Complete drink but this time before the gym. I also ate a Stinger Waffle afterwards. I had a ton of errands to run and I wanted to ensure I would not be hungry until noon. 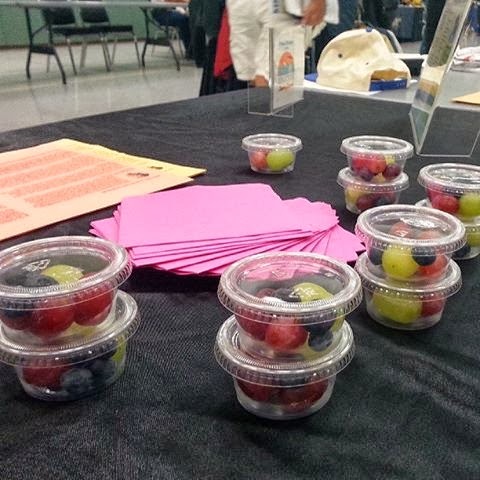 Tomorrow I'm going to an event to talk to Veterans about my health coaching services. Day 6: I attended the Veterans Stand Down in Ridgecrest as one of the nearly 60 service providers shared free resources with the community. It is truly rewarding encouraging others in their wellness journeys. As a L.E.A.N. coach, I offer free wellness presentations to non-profit organizations and other wellness chapters like last week's diabetes support group. I am able to offer these free presentation as a courtesy first and foremost but I can continue doing them when clients meet with me one on one for private health coaching or by taking one of my at-a-fee classes or ordering the plant based nutrition in a capsule or chewable or our protein powder. I chose to take my own breakfast and lunch though it was served free of charge to the vendors and veterans. I started my day with a chocolate Complete and coconut milk shake and then ate a greek yogurt with granola. I packed a peanut butter and jelly sammich (100% whole wheat bread, natural peanut butter, and organic strawberry preserves). I also packed grapes and blueberries and my JP+ gummies. They served breakfast burritos, hot dogs and pulled pork sammiches with chips and watermelon. Sodas and water offered. In the picture, I shared free samples of red and green grapes with blueberries and a flyer on the importance of antioxidants. Day 7: I fit in my workout regimen by using my stairs, chairs, and beyond to got in some good stretches. 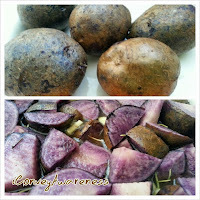 I picked up our CSA box this morning and saw that we had received purple gems ... well, not gems, but potatoes. I had never eaten them before and was excited to try them! They are antioxidant rich! A blog post will follow on their benefits with my recipe. I also roasted chicken breast with onions and carrots. I roasted both dishes in my DIY vegetable broth. S-C-R-U-M-P-T-I-O-U-S! That recipe will also be shared in a post soon. You will love it as much as I do! Eating clean (or cleaner) is a huge component to wellness. If you're actively exercising, your fuel should come from real whole foods as much as possible. If you're sedentary, it's even more reason to eat the best you possibly can daily. If you know someone who could benefit from my encouragement, please have them subscribe to my blog and / or contact me privately.